Home CDN , children , crafts , feature , holiday , holidays , homeschool , January , papercrafts , printables , US , worldwide January 20th - Featuring Rollercoaster Freebies! January 20th - Featuring Rollercoaster Freebies! 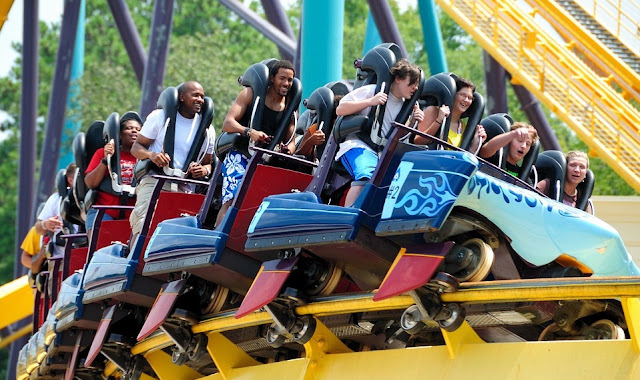 -- The roller coaster is a popular amusement ride developed for amusement parks and modern theme parks. LaMarcus Adna Thompson patented the first roller coaster on January 20, 1885. In essence a specialized railroad system, a roller coaster consists of a track rising in designed patterns, sometimes with one or more inversions (such as vertical loops) which turn the rider briefly upside down. -- Tired of the same old, rickety wooden roller coasters? Crave more thrills than the typical vertical loops and camelback hills found at every local amusement park? Fortunately, roller coasters come in a mind-blowing profusion of styles, shapes, and sizes. From innovative track designs to unusual seating configurations, from ridiculous locations to bizarre theming, the experience never gets old. The 50 Most Unique Roller Coasters Ever Built is a list comprised of unusual, rare, and hard to find scream machines. • World's Fair Grand Roller Coaster -- Cars slowly climb uphill as excitement builds, then race down the winding track of this beloved amusement park attraction. Support pillars feature color changing LED lights to add to the thrill of the experience. Hand-painted details enhance the miniature figures in the cars and on the platform. The platform itself features a miniature ticket booth, decorative paneling, and an amusement-park-style arcade topped with the traditional red-and-white striped carnival roof. Plays 25 Christmas carols and 25 year-round classics. • CDX Blocks Cyclone Roller Coaster -- The Cyclone roller coaster is a LEGO compatible building block system. It is the first fully functional roller coaster kit of its kind. Using a combination of custom designed block parts along with standard block components. The Cyclone is engineered for quick assembly and realistic operation via gravity. - Comedian George Burns was born at New York City on January 20, 1896. He began in vaudeville without much success until he teamed up with Gracie Allen, who became his wife. As Burns and Allen, the two had a long career on radio, in film and with their hit TV show, The George Burns and Gracie Allen Show. Later he played the roles of God and the Devil in the Oh, God! movies. He lived to be 100 years old, and died on March 9, 1996, at Los Angeles, California. - Today you can enjoy buttercrunch ice cream, candy, or anything buttercrunch. Spend the day with one of your favorite snacks. Make it your personal goal to have something with buttercrunch at each meal, and as a snack. Tomorrow, you can return to your diet. - Cheese is nutritious food made mostly from the milk of cows but also other mammals, including sheep, goats, buffalo, reindeer, camels and yaks. Around 4000 years ago people started to breed animals and process their milk. That's when the cheese was born. Go out to your local cheese shop and try something you've never had before. - At 12:00 noon on Inauguration Day 2009 (Tuesday, January 20, 2009 -- the date and time are defined by the Twentieth Amendment to the U.S. Constitution), Barack Obama became the 44th President of the United States. On Inauguration Day 2016, Donald Trump became the 45th President of the United States. - RV workers see a slice of America if they are working in an RV park or resort or even a tourist attraction. They may not see the circus or delegates to a convention, but they do see a variety. RVers come in all ages. They include families, tourists from the U.S. and foreign countries in rented RVs. Some have pets, some travel with all sorts of toys. Some travel in new million dollar buses, others in pop-up trailers, tiny teardrops or ancient RVs which have seen better days. - Five companies (Hitachi, JVC, Philips, Matsushita and Sony) agreed to cooperate on the construction of a camera with a built-in videocassette recorder. - A disc jockey, also known as DJ (or deejay), is a person who selects and plays recorded music for an audience. Originally, disk referred to phonograph records, while disc referred to the Compact Disc, and has become the more common spelling. - Outdoor activities such as taking a nature walk together are a great way of keeping the family fit and spending quality time together. - Spend a little time learning about penguins - reading a pictorial book or internet site is fun. You can also watch a documentary of these cute and popular, grounded birds. This day is also a time to wear black and white - penguin colors. However, wearing a tuxedo in their honor is optional. It is also popular today to tell a penguin joke or two.